FAICHNEY Motor Oiler Grease Gun Brass BOULEVARD Rare! This is a very rare, early grease and oil gun, or at that time called an MOTOR OILER. This is a top quality made oiler! It is all brass, and made much like a syringe, it has an all brass inside plunger, no O-rings and it doesn't leak at all, air tight. It is not highly polished, but has a nice finish on it. 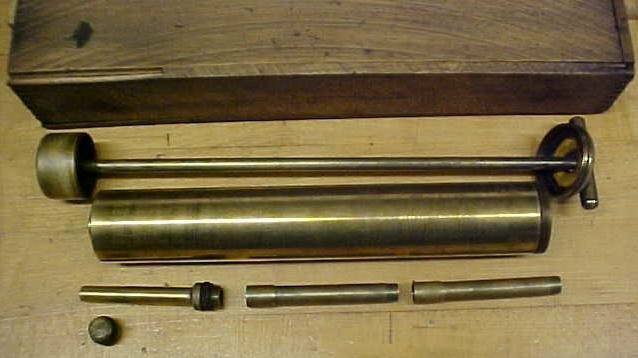 The attachment are also all brass. Two out of the 4 fit the threaded end of the oiler, the other two came with the set, but I think they must be adapters for an oiler port on an early automobile. There is a supplied thread plug or cap for the end so grease or oil could be safely store in the oiler during transport in a truck or car. 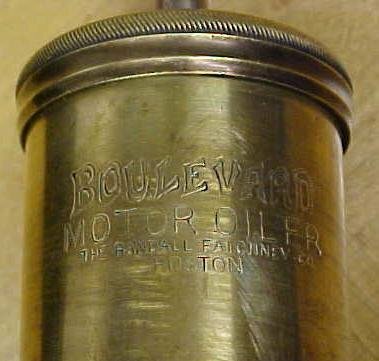 The oiler body is marked "BOULEVARD MOTOR OILER THE RANDALL FAICHNEY CO. BOSTON" on the main body, and is also marked with a fancy design logo showing the oiler and an auto chassis, and this text "B-LINE TRADE MARK". The lap jointed corners old hardwood box is original as it has corresponding information on it. 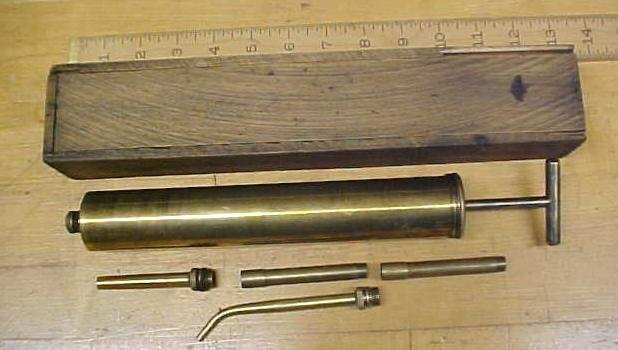 This oiler is is 12" long and 1.5" diameter. It just barely fits into the box with the end plug cap in place, and there is just enough room for the attachments. The brass has been well protected by the box over the years, so the oiler is in very good condition overall, some minor tarnish, and a little bit of old grease inside, otherwise no damage, very clean. The original box is quite nice also, since the original label is still legible, and it is solid and clean too! The box has a slide on top, and the top is very good, we do note that there are two chipped off areas at the entrance area of the box where the top slides into slots provided, but there is still plenty of wood there to effectively hold the top in place in the slots, so the box is still functional as is. We also note a few other much smaller gaps and chipped off wood areas, but considering how thin this wood is, and it is about 100 years old, the original box is in amazingly good shape, well cared for! We found an add in a 1911 magazine that shows this "B-LINE" type gun or motor oiler. The add shows a man using the oiler on a car. The add reads "MOTORIST HELD UP! BY DRY BEARING B-LINE GUN TO THE RESCUE" The add states that this type of gun was design for emergency use only, and will deliver grease or oil just where you need it. The add also give the company name "THE RANDALL-FAICHNEY CO." at the bottom. A really interesting automotive antique, from the early years of the automobile accessories age! 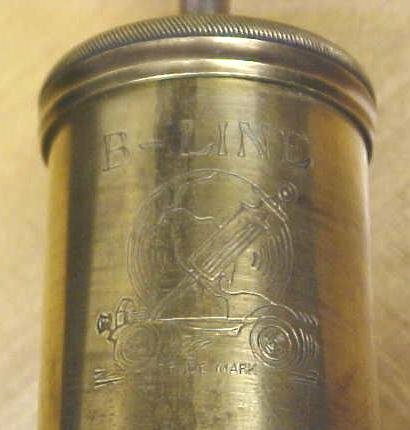 THE RANDALL-FAICHNEY CO. also made medical syrings, so this may help explain the quality and design of this oiler. Items Similar To "FAICHNEY Motor Oiler Grease Gun Brass BOULEVARD Rare!"